The moon jellyfish is on his way to a lobster funeral perhaps. Mary MacADNski: Sun-bleached and going nowhere. Mary MacADNski: I always wonder of the bravery to eat the first one especially if they cooked them themselves. Oh dear! Let's hope, though, that it gave its life for greater good. Jellyfish do make me quite apprehensive as some have painful strings. 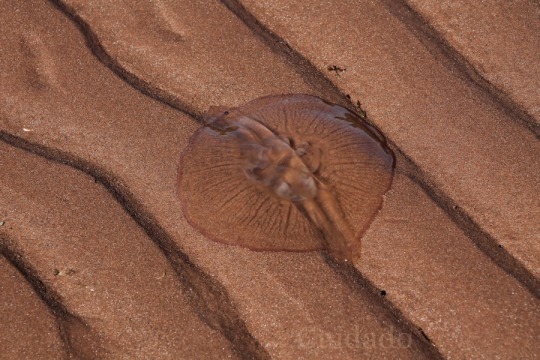 Mary MacADNski: We just rub our jellyfish stings with sand if we get them but just normally try to avoid them. ,,, a friend of mine got stung when swimming and to get some relief has his son urinate over the affected area! Mary MacADNski: Oh well, I taught you proper common practice above. The pain lasts only a very short time anyway, even without rubbing sand on the sting. https://youtu.be/7xapGxL09-I?list=RD7xapGxL09-I Sorry about those caps. Fabulous pictures... love the close-up and the picture of the jellyfish is wonderful. These animals always intrigue me. Mary MacADNski: Some little jellyfish litter the sand but at the return of the tide they are swept away, food for some other creature, perhaps a lobster, scavengers that they are. two good pictures. I always think jelly fish are the most strange of creatures. Mary MacADNski: I have eaten them. I was brave. The lines in the sand are mirrored by the lines on the lobster shell. Mary MacADNski: They are and the carapace is so faded it will soon become part of the sand. Death on the beach eh Mary. Mary MacADNski: Actually, a summer walk on a stormy day. Mary MacADNski: I have eaten them in a fabulous Chinese restaurant years ago. One other brave soul and I shared it.